Jazz musicians, probably more than any others, have hijacked fairly simple popular tunes and turned them into much edgier pieces for decades, from John Coltrane’s inspired reinterpretation of Rogers and Hammerstein’s My Favourite Thing from The Sound Of Music to Louis Armstrong’s version of Mack The Knife, originally from Bertolt Brecht’s Threepenny Opera. It is also the approach adopted by London-based pianist Bruno Heinen for the first album with his formation, Dialogues Trio. 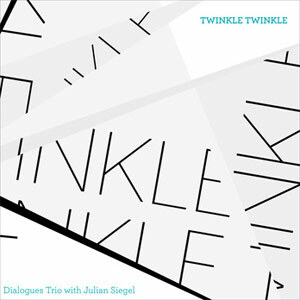 Using the nursery rhyme Twinkle Tinkle Little Star as a starting point for this album, the trio, here accompanied of British reeds player Julian Siegel, freely reinterpret the theme into ten variations which vary quite drastically in scope and perspective. Formed in 2005 by Heinen, bassist Andrea Di Biase and drummer Jon Scott, Dialogues Trio have since toured substantially in Italy and are regulars on the London jazz circuit. Whilst Heinen and Di Biase are the primary composers within the formation, the entire trio is credited for almost half of the pieces collected here. If all the tracks are based on Twinkle Twinkle Little Star, the way it effectively infiltrates the resulting compositions varies quite greatly. Sometimes, the ear will pick up a hint of a familiar motif and identify it clearly enough to associate it with a particular section of the song, as is the case with some of the piano sections on Waltz For Rosie or briefly on Nocturne or Night Hue, or with the obvious bass phrase on Jumping Rocks, but the trio’s reinterpretations are, for the most part, extensive and drastic, with the original piece filtering through in much more obscure fashion. In fact, they often appear to source a flavour of the nursery rhyme in their pieces, in a way a chord progresses perhaps, or in a rhythmic pattern more than try recreating any particular part of the song. This leaves them quite a lot of freedom in their approach, and gives them plenty of opportunities to shine equally as much as composers as they do as musicians. The addition of Siegel, far from distracting from the trio’s performance, enhances it. Although not present on every track, he brings a fine balance between robust earthy tones and lighter moments, not only by alternating between sax and clarinet, but also through his interpretation of the slight mood shifts dictated by the trio. On the pieces where they operate as a unit, Dialogues Trio appear at once incredibly tight and focused, their performance remaining for the most part fairly stripped down and to the point, but allowing for occasional flourishes. More than a constraint, the idea of starting each of the ten tracks collected here from the same point of reference allows for quite a varied collection, but it certainly provides a thread, as insubstantial as it may at times be, throughout, and showcases the trio’s creativity in a rather convincing way.